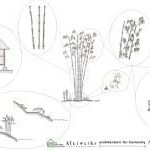 The term "natural building" refers to a range of construction methods that use locally sourced or minimally processed materials including straw, earth, stone, bamboo, and sustainably harvested wood. Natural buildings are healthier for the people who live in them and healthier for the planet. Many natural building techniques are inspired by vernacular architecture from around the world. The reexamination of these traditional techniques in light of building science and engineering has delivered a way of building that supports today's ecologically mindful lifestyle, complies with codes, and withstands the test of time. Using artisanal techniques with a rich history, we create unique structures with a human touch.